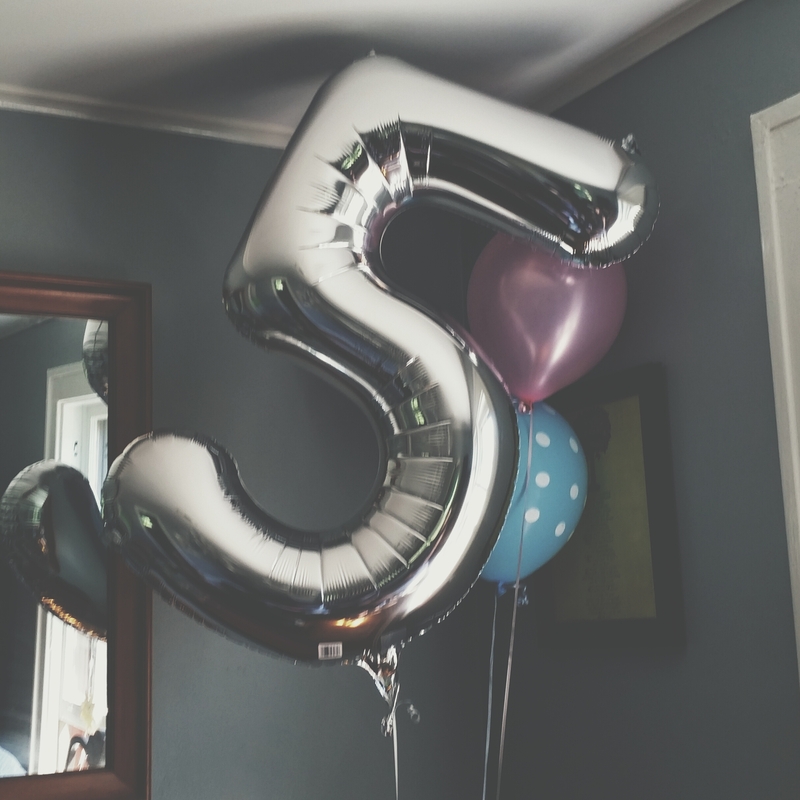 Birthday’s, like any holiday, are interesting days – either they are one of your best ever, or you find yourself comparing your life to Samantha Baker’s in Sixteen Candles. As a parent, my daughter’s birthday really is one of the best days ever (party! ice cream! balloons! ), but I found myself staring at the glittery, pink candle on her cupcakes, biting my lip, and thinking, wait. How did this happen? 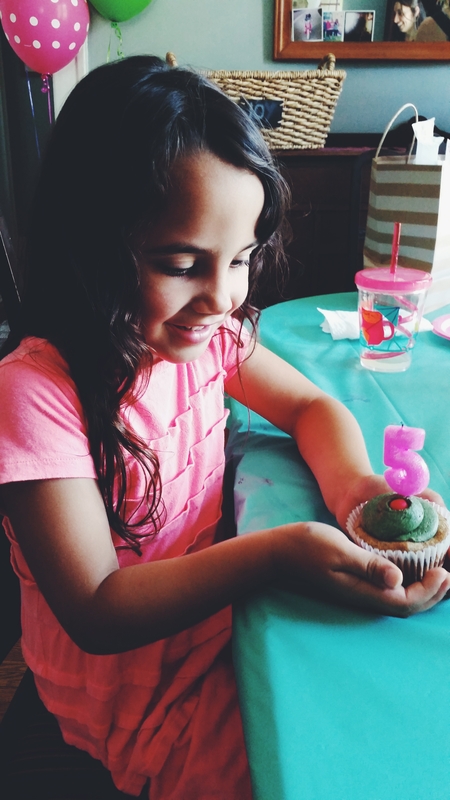 This past week has been a wonderful whirlwind of friends, celebrations, and joy as Olive turned 5 last Monday. Hooray! Exciting party details aside, I’m still genuinely amazed I have a five year old person in my house, for a couple of reasons. First, that I still have all my hair, secondly, that she seems to be turning out more than ok, wonderful even, and lastly, where did the time go? When you have a newborn, after a veteran mom or dad finishes cooing and ahhing over you and your baby, they will look you directly in the eye and say, “Cherish these days. They will be over before you know it.” The terrible twos come and you find yourself actually enjoying the distraction of folding laundry, thinking oh PLEASE let that person be right, let this be over before I know it. And one day you wake up and you have yourself a real, live, Kindergartner. A little person who can spell their name, who gets your bad jokes and still laughs, and who knows the difference between Nana’s and Mama’s homemade cookies and has an opinion on which one tastes better. And you think, hang on – she’s not even in high school yet, and I have severe nostalgia already? What kind of mess am I going to be in 9 years when she is ready for high school? This isn’t even the big leagues, we are still in “little girl” stage, and I’m already panicking that I ignored the all-knowing parents who told me to cherish every second. I don’t even remember the date she took her first step. I don’t recall her first full sentence. Where did it go? Where did I go in those moments? After spending a few days angry at myself over my lack of attention to detail, I told myself, instead of feeling angry about it, fix it – today! Right now. There is no better moment than right now. So I’ve started really focusing and paying attention to every tiny Olive detail. I listen to rhythm of her brushing her tiny teeth in the morning, rummaging through her toys to find the perfect one to bring to Nana’s, crunching her cereal and scraping her bowl a little too loudly. Sounds that will get denser and less pronounced with time as she gets older, bigger, savvier. I silently count every tiny “kiss” (freckle) on her arms, how many cartwheels she can do in a row this time, count the endless curls in her hair. Watch her furrow her brows while attempting to draw the “perfect O for Olive”, notice the way her little nose scrunches when she baby talks to the cat, hold her tight in a big mama bear hug when she is sad. Sounds, scents, sights, touches that only I will know, that only I will remember, and that I will still hear, see, and feel 20 years from now if I close my eyes and remember hard enough. Even on the roughest mornings when Olive’s little fists swat the air and she stomps her feet, squishes her face and says, “No, mommy I do NOT LIKE THOSE SHOES I LIKE THE PINK ONES!”, after a quick eye roll and smirk, I can’t help but marvel at this tiny person who is so sure already of what she does and does NOT want. Did her cheeks always get that red when she is mad? Was it just 4 years ago we were learning how to eat with a fork and spoon? When did my sweet, opinion-less, gurgling little blob become a girl with favorite shoes? When did she perfect the heel-turn and hair toss as she stalks into the other room to put the “too big just yet” pink boat shoes on? I smile in even the most frustrating moments because it is still that only moment I will ever have with her. Sure, some days I am better at it than others, but I’m getting better at heeding that not so crazy advice to take it ALL in, pay attention, and really LIVE in our moments together. Even the “Shoe Wars” ones. Happy Birthday, Olive! Even when you’re too big to fit in my lap, I’m still going to hold your hands while you sleep, and remember the sounds of your five year old self, breathing, dreaming, brushing, rummaging.